Before the age of word processors and cheap, high-resolution printers, most science fiction fanzines were authored on typewriters and reproduced on messy and unreliable mimeograph machines. The resulting appearance was at best amateurish and at worst unreadable – though most fans were hungry enough for the content to look past these flaws. 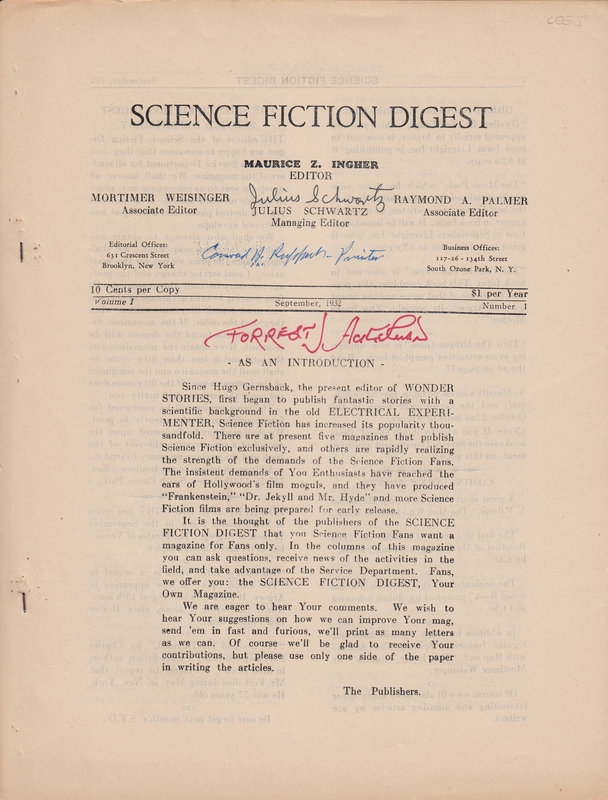 Science Fiction Digest was clearly distinguished from its peers by a highly professional look produced on an offset printer. It’s easy to believe that this presentation quality contributed significantly to the attention and credibility paid to the publication and its staff by the leading commercial science fiction magazines of the day. SFD owed its distinct look to Conrad H. Ruppert. In this section, we pay tribute to Ruppert’s contributions by presenting some of the marvelous research on this era of fandom by John L. Coker III. Many thanks to John for creating this material and allowing it to be presented here.